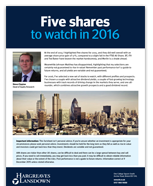 Find out the five shares, Steve Clayton, our Head of Equity Research, has chosen to watch in 2016 - request your free copy now. This report is noThis report is not personalised advice. t personalised advice. This report is not personalised advice. Please remember that the value of shares can fall as well as rise so investors could get back less than they invest. Dividends, where quoted, are variable and not guaranteed. Plus - A high-street favourite which has almost tripled operating profit since 2008. Clear, concise information without the hard sell. Clear literature which is very easy to understand.